There was a moment when Tracy Dahlkamp doubted that she could pull off bringing back the Lake Murray Fireworks and MusicFest. She wasn’t sure that people cared enough to bring back the annual July 4 event. Dalhkamp and the other volunteers who took it upon themselves to revive the annual event at the Lake Murray playground found both the money and the community support they needed to put on the fireworks and music festival — around $76,000 — much of it coming in during the last few months of fundraising. “We really hit the ground hard in April and it really paid off,” she said, adding that the group even raised some beyond the needs of this year’s event. Although enough money has been secured to produce the festival the organizers wanted, Dahlkamp said they are still looking for the community’s help. Interested people should contact lakemurrayfireworks@gmail.com. The push for volunteers to help clean up the surrounding neighborhoods after the event is part of an overall message the festival organizers want to convey to the public about being aware of noise, trash, traffic and parking in the surrounding area. Like all large events that draw people from all over, parking will be limited and traffic will increase. 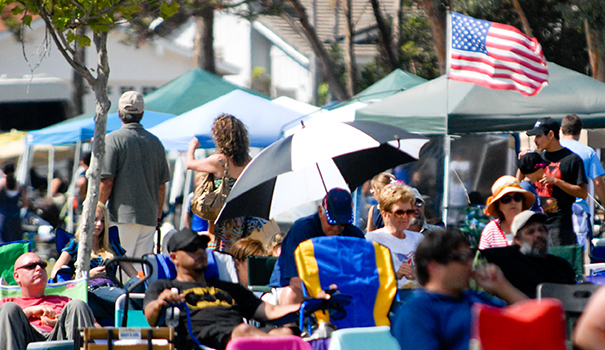 There will be traffic and parking control on both the La Mesa and Lake Murray Community Park sides of the lake. “[La Mesa police] anticipate the La Mesa side to be full by noon,” Dahlkamp said, adding that there will be parking along the baseball fields but some of it will be closed off. Some areas behind the park will also be closed off for loading and unloading. Handicapped parking will be available near the park. Alternatives to driving, like walking or biking, are preferred whenever possible. “I would really encourage Uber. I think that’s a great idea,” Dahlkamp said. In the festival area, there will be designated locations for people to set up canopies or tents without stakes. “If that is something people are interested in, I would encourage them to come early, because we are going to be blocking off the center of the park itself to be open,” she said, adding that the area close to the stage will be for blankets and low-back chairs only. 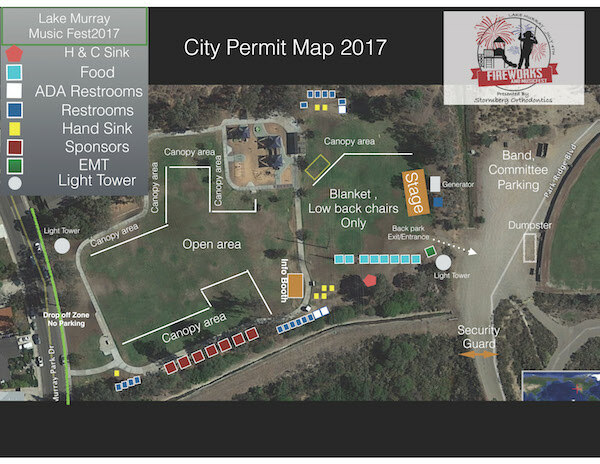 As per the rules of the Lake Murray Community Park, there will be no bottles allowed and all dogs must be leashed. Dog owners should be aware how their pets react to fireworks and are encouraged to visit the Humane Society’s information sheet on fireworks at bit.ly/1RDYlYV. There will also be an information booth onsite, which will serve as a lost and found and first-aid station. 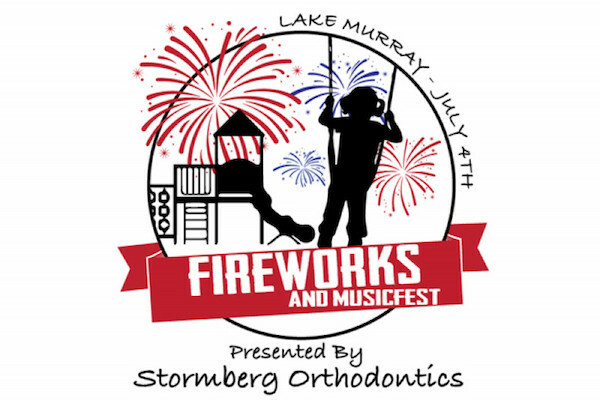 For a more complete list of rules, updates on parking and answers to frequently asked questions, visit lakemurrayfireworks.org. 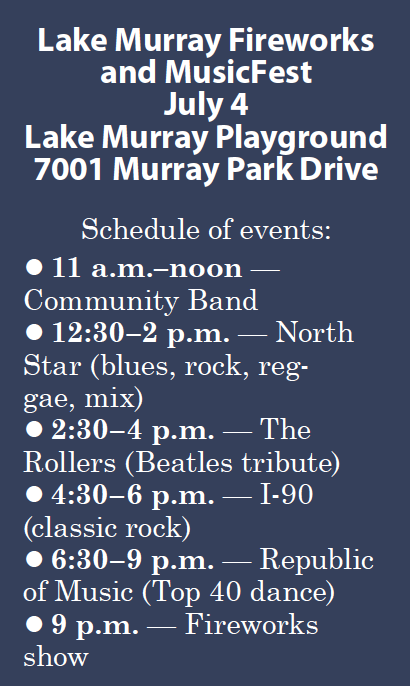 The music will start at 11 a.m. and the festival music lineup is a mix of blues, classic rock, Top 40 dance hits, a Beatles tribute and a community band. Food vendors onsite will include Windmill Farms, Bullseye Kettle Corn, Rita’s Ice Cream, Admiral’s Experience Restaurant & Catering, and the Kiwanis Club will be cooking hot dogs and hamburgers. “We are still looking for a taco vendor,” Dahlkamp said. 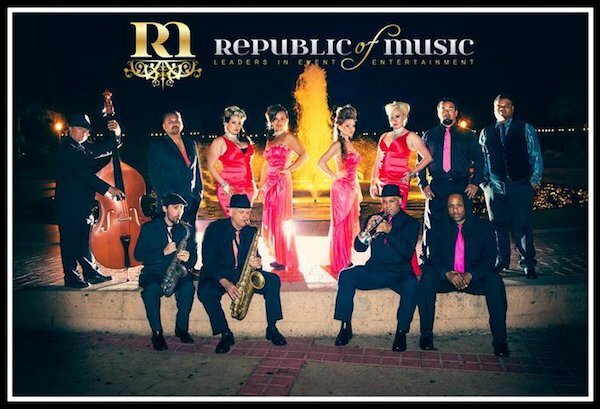 After the music, the fireworks display will begin at 9 p.m. and will be set to a soundtrack mix created by Vincent Dornisch of Pacific Sotheby’s International Realty. Dahlkamp said a special thanks should be given to the San Carlos Recreation Council for its support in organizing the fundraising for the festival. In addition to title sponsor Stormberg Orthodontics, the following are also major sponsors: Perry Family; Windmill Farms; High Dive Bar & Grill; Converge Community Church; Orchard Supply Hardware; FBS Property Management; Brothers Family Restaurant; Sporting San Diego; The American Dream Company; Ideal Plumbing and Air; Life Deck Coating Installations; San Diego City Firefighters AFL–CIO; Nevium Intellectual Property Solutions; Precision Concrete Designs; Mission Trails Financial; Brian and Michelle Cox; Hanken Cono Assad & Co., Inc.; April Boling; San Carlos Little League; Navajo Softball; Rita’s Ice Cream; Spine & Sport; The Print Button; Law Office of David J. Hollander; RHotz Creative Media; Primo Concrete; Harold Swartz Jr.; KTA Construction, Inc.; and Jeff Katz Architecture (JKA). —Jeff Clemetson can be reached at jeff@sdcnn.com.